You might not know this, but your home looks best at night. If you have a landscape lighting system you know what I mean. If you don’t, you are missing out. Landscape Lighting, particularly low voltage LED landscape lighting, is one of the best investments that you can make in your home. Read on to learn more reasons your Dallas home deserves a landscape lighting system. When a home is designed, material is selected, and landscaping is chosen the goal is to make the home beautiful. But daylight just doesn’t provide the drama that carefully designed landscape lighting can create. In coordination with a talented landscape designer, great landscape lighting can make your night scape the preferred way to view your home. Layers of light can help define spaces and make a yard look bigger than it actually is. Path lighting can draw the eye from the sidewalk to the front door making it appear inviting. Tree lighting can can create texture and depth that the sun simply cannot recreate. Curb-appeal, is it is called, is a major driver in purchase decisions when it is time to sell your home, and nothing drives traffic to an online listing like a twilight photo of a beautifully landscaped home. With landscape lighting you can get more enjoyment out of your home, and get more when you go to sell it…who wouldn’t want that? One often unexpected effect of landscape lighting, is making the interior of the home seem to grow. It is expensive to add square footage to a home, but landscape lighting can give you the sense of a larger home far cheaper than actually adding space to the home. At night, a dark yard gives the appearance that the room stops at the windows, and extreme darkness has a way of closing in on a space, making it feel even smaller than it is. 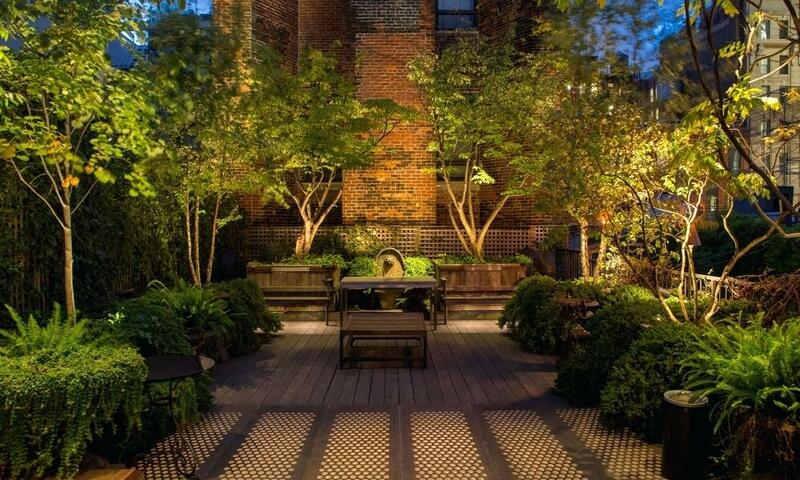 When the view out the windows is of a wonderfully lit yard the room seems to expand out into the outdoor space. As if by magic, the rooms feels larger and any sense of claustrophobia disappears. As windows get larger, such as in transitional Highland Park homes, this effect is multiplied. Being able to see into the yard also imparts a feeling of safety that comes from removing the unknown created by dark windows. Speaking of safety, another benefit to landscape lighting systems is the security it provides. Landscape lighting and smart landscape design are incredibly effective at preventing crime, and they look great while doing so. Security bars, motion lights and “BEWARE OF DOG” signs may help with security, but they also look terrible and probably scare away more neighbors than bad guys. Conversely, a well-lit yard with no dark hiding spaces not only looks beautiful, but it removes the ability for a would-be thief to hide and will convince them to look for an easy target elsewhere. Path lighting will make it easier to move around the property at night, reducing the risk of trip-and-fall injuries to residents and guests. 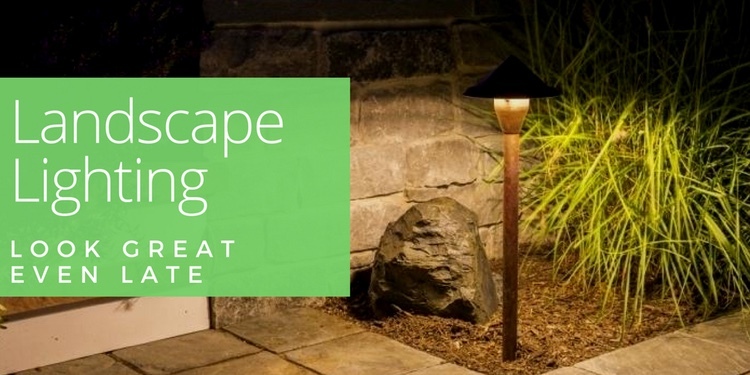 One final reason to add landscape lighting to your home, is that it allows you to spend more time outside. In McKinney, TX, where we are located, it is almost impossible to enjoy the summer while the sun is out. In the evenings it cools off and we move outdoors. With landscape lighting evening parties can extend right into the night, with no worries about sunset and darkness. Summer parties end when you want them to end, not when the sun goes down. At Audio Video Innovations we install the premier landscape lighting and outdoor lighting system in the USA, Coastal Source. Coastal Source features patented connectors (Coastal Connectors) that resolve the issues with failing in-the-field splices. They also use high quality CREE LEDs for perfect color and fantastic performance. We can provide the highest quality outdoor lighting with industry leading reliability, low power consumption, consistent color. Contact us today at 972.529.4470 or info@avinnovations.net to schedule your FREE landscape lighting consultation.